Eyes On KMAC Interns: Oh Cecilia! On Friday (Jan 4), a new exhibit, Home Away Home, opened on the 3rd Floor Brown-Forman gallery, which counts as the third exhibition curated by a KMAC intern. It just so happens it is the second exhibit at KMAC curated by Miss Cecilia Adwell. You could say, she likes it here. 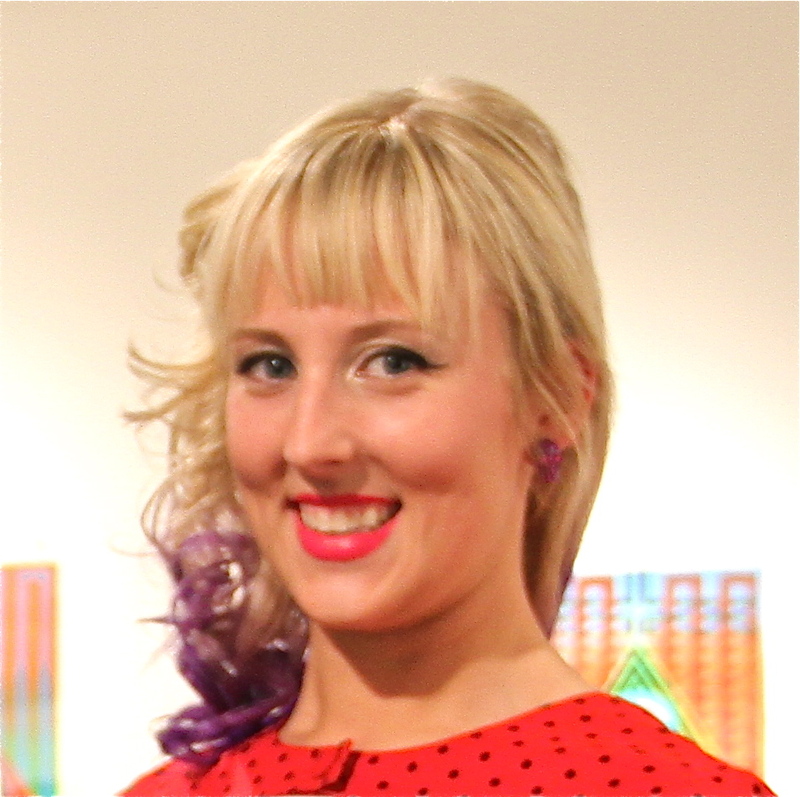 Cecilia is a vibrant person from her violet dipped platinum blonde hair to her cheetah print stockings, which serves her well as a student passionate about the creative and vivid world of folk art. Her way of thinking about curating a show and bringing together pieces from KMAC’s permanent collection is quite interesting and it has brought a lively energy to the third floor gallery space. Even though the recent Home Away Home has been “in the works” for some time, it didn’t become a reality until her winter break from the California College of the Arts – San Francisco when she could come to Louisville to organize the exhibit. I caught up with Miss Cecilia to ask her about her experience as an intern at KMAC. Well, I’m originally from Oldham County, KY. My father worked in the prisons there. Being surrounded by artwork from inmates is really what peaked my interest and appreciation for self-taught or “outsider artists”. In high school, I moved to the city (Louisville) and received undergraduate degrees from Jefferson Community College and Bellarmine University. While at Bellarmine, I spent a summer in London working for a commercial gallery. I decided then that exhibition making was what I wanted to pursue so upon my acceptance to the California College of the Arts, I moved to San Francisco where I am currently studying for my MA in Curatorial Practice. Tell us something you’ve learned from your experience here. Being a part of this museum has been an invaluable experience. I worked as an education intern before Aldy was hired and to see the direction the museum is moving is really exciting as a student curator focused on craft and folk. The integration of folk and craft within the larger fine arts world has been happening for decades now and to see it in action on the museum level is really encouraging. You’ve curated two exhibits at KMAC. Which would you deem more successful and why? This is a tough question. “Success” is a problematic term for me because there are so many levels of “success” that can be achieved. 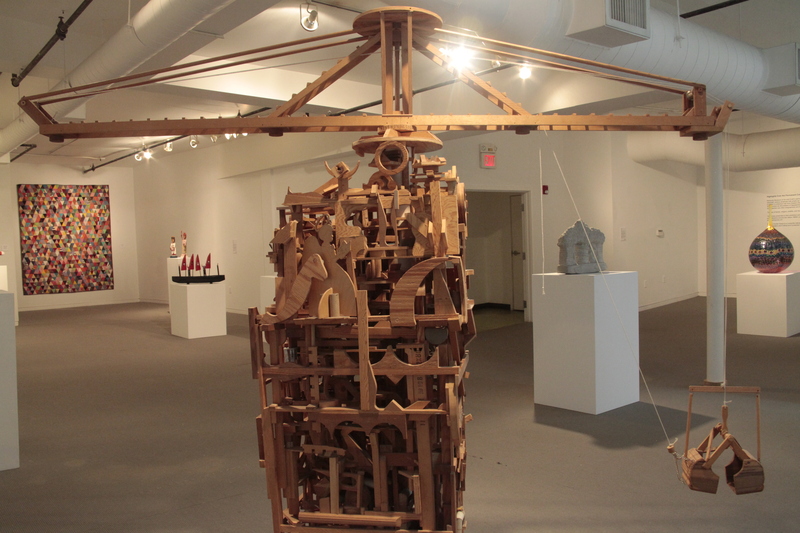 Hollers And Harvests and Home Away Home are two very different exhibitions. Both succeeded in bringing local, young artists into the conversation with Kentucky’s historical folk artists. Hollers and Harvests was very straight forward and didactic in approach, which is great for museum visitors. Home Away Home has a more complex curatorial approach, which was more difficult to explain to the public, but overcoming those difficulties was more satisfying. All in all, if the museum is happy, the visitors are engaged, and the artist I’m working with is happy, then I feel the exhibition was successful. 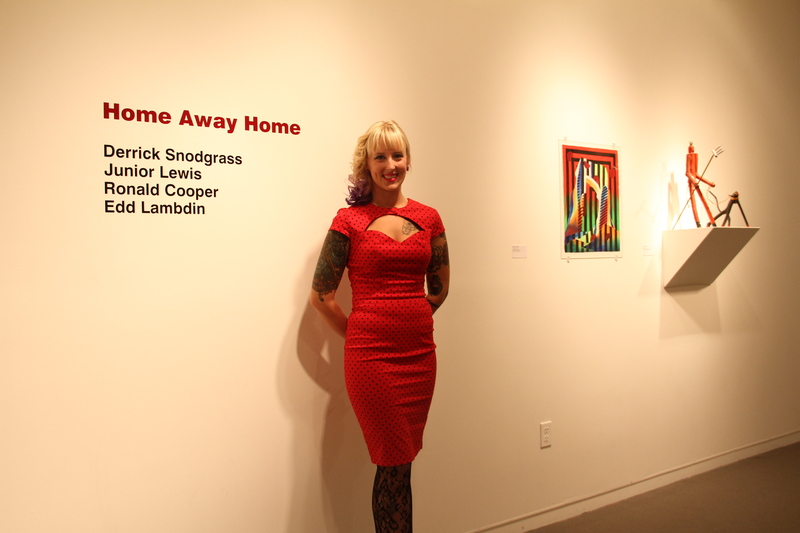 How did you choose Derrick Snodgrass to be a part of your recent exhibition Home Away Home? Derrick has a very magnetic personality. I was first introduced to him at ACME Ink Tattoos in the Highlands I then went online to look at his tattoo portfolio and came across his paintings. I was hooked. I was looking for an artist to choose pieces from the KMAC collection in order to find inspiration for producing new work and I felt he would do a good job with interpreting some of the darker themes present within the collection with his own work. I am so happy with the work that came out of this process. He did such an amazing job. 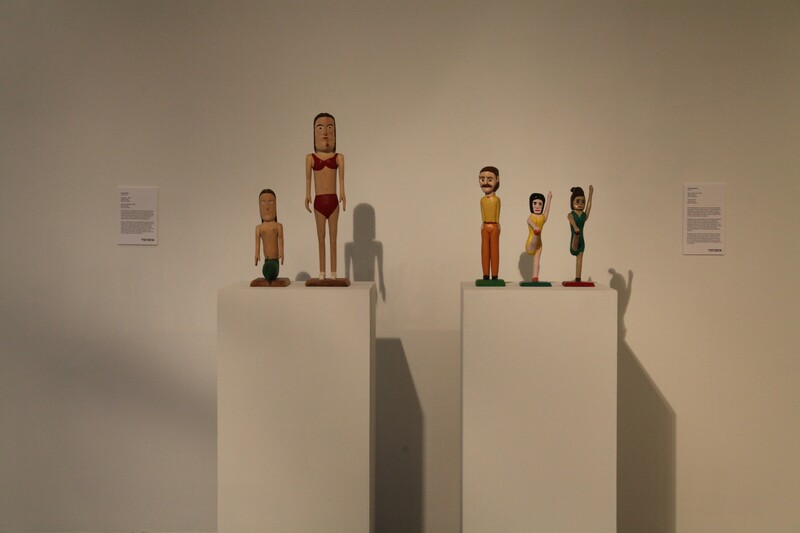 You’ve worked with KMAC’s folk art permanent collection quite a bit, do you have a favorite folk artist or story from working with these pieces? Through organizing and researching the collection I have grown an attachment to the artworks and the people who have made them. I love the overall story of Kentucky’s folk art history, learning about how artists are connected through familial ties and how artists arrived at a career in art through hard financial times or as a result of emotional or physical trauma is really a beautiful thing. I love that most of these artists don’t explain a lot of their work, when you learn about their personal life, it just makes sense. 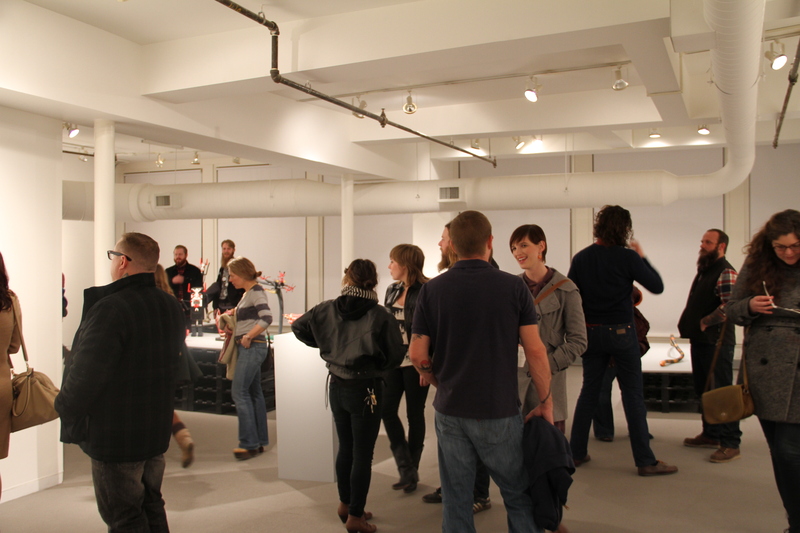 Strangest comment you’ve heard at one of your exhibition openings? Well, I’m pretty strange myself so nothing really surprises me. What are your plans after your internship at KMAC? I graduate in May and I’m terrified. I don’t know what my plans are yet, but I do know that I want to work with a museum that contains objects and artworks that I am personally passionate about. My goal was to leave Louisville and eventually return home to share what I’ve learned with the community, but I don’t know when this will happen. I just want a museum job that makes me happy and allows me to flex my creativity. Making a little money wouldn’t be so bad either.